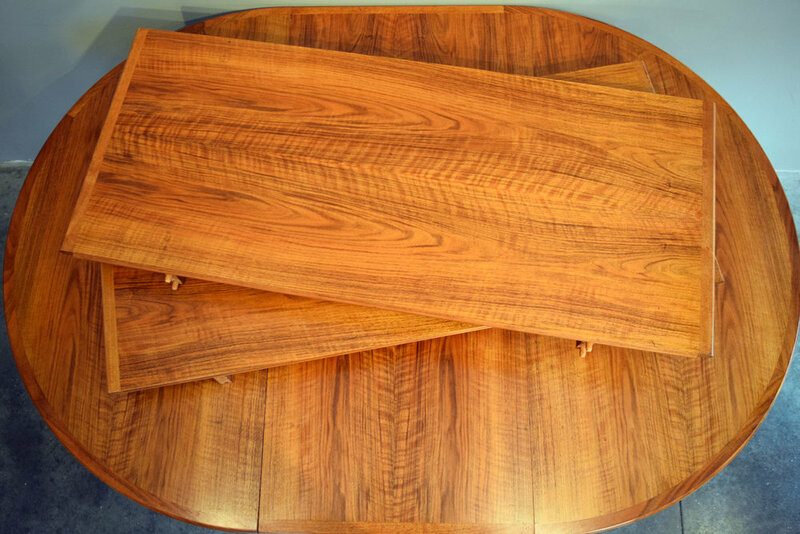 This is a drop-dead gorgeous dining table. The walnut is beautiful, with glowing and iridescent graining. The detailing and construction are extremely fine. 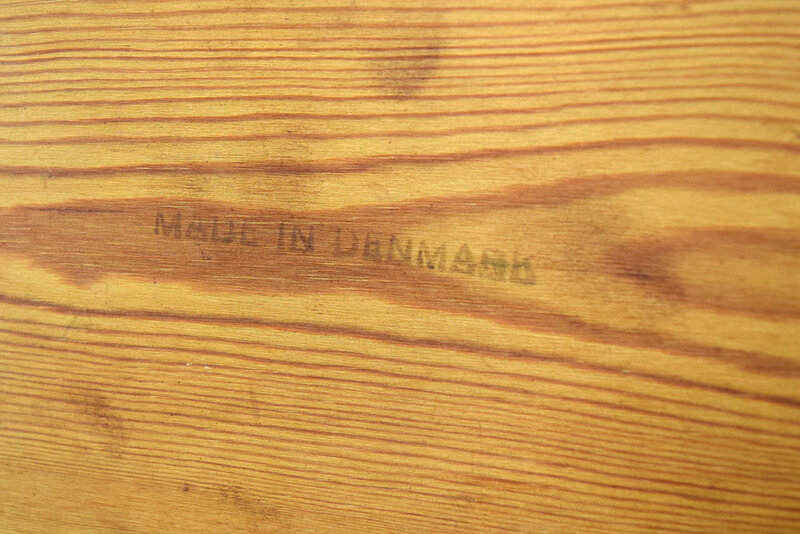 Although unmarked, we believe this piece was retailed at Mills Denmark in New York, and probably made by Søborg Møbelfabrik in Denmark. 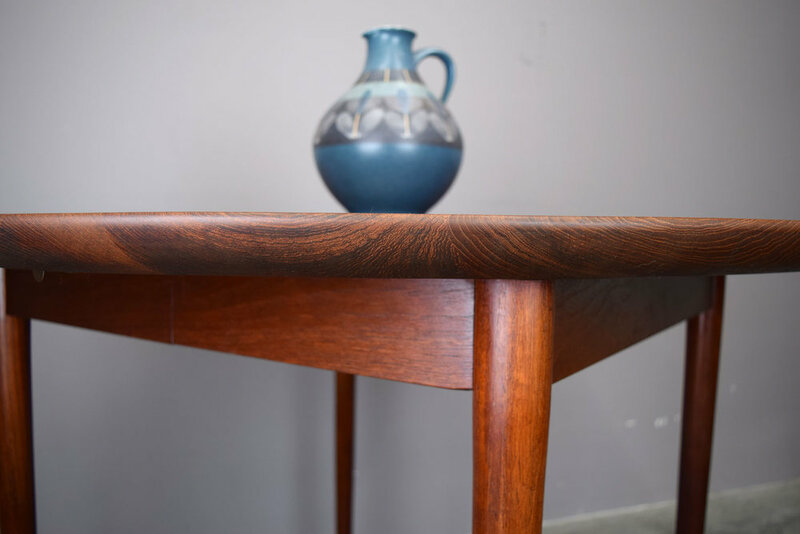 This table shares many details with tables by Peter Hvidt & Orla Mølgaard-Nielsen that we have sold in the past. We love the fine, rounded edge banding, elegantly arched apron, and high quality construction. It’s a stunner! In excellent vintage condition. 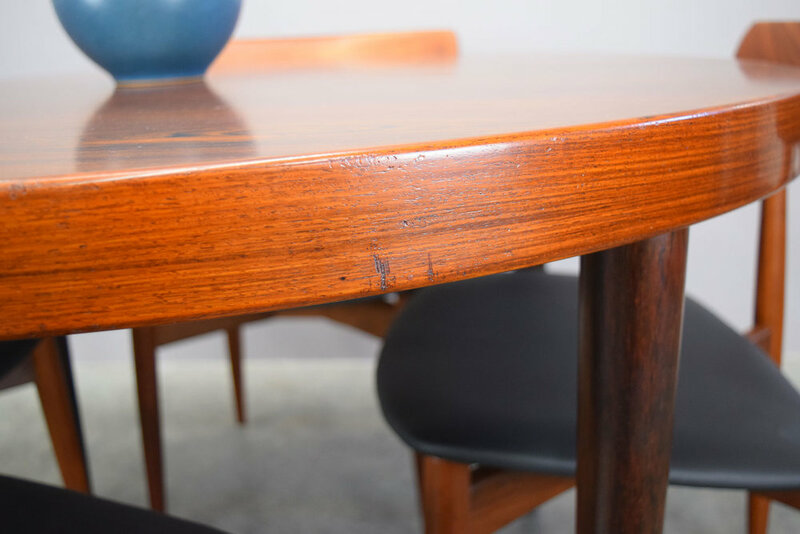 The table top and leaves have a couple of minor scratches and blemishes as shown. The leaves have slight wear to the edge banding from storage. One leg has a very minor non-structural crack to the inside. 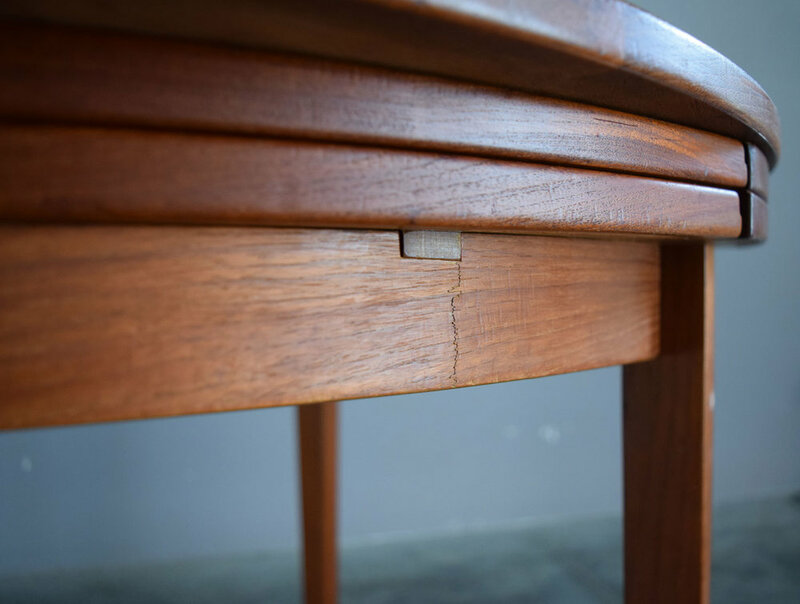 The table was originally designed to be used with no leaves, one, two, or three. All of the leves are fully skirted to match the table. We recommend using the table with at least one leaf installed. Over time the fit has changed, and it’s difficult to get the two halves together (and apart) with no leaves. What a handsome table! 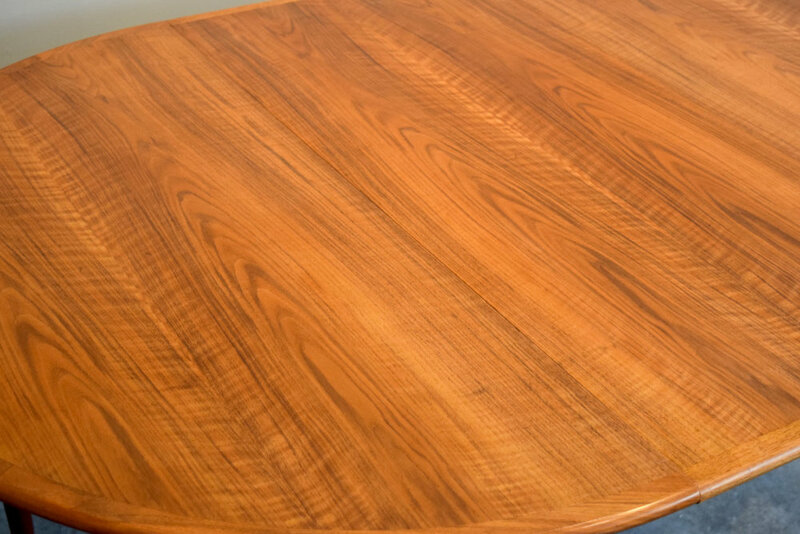 Absolutely gorgeous matched teak top with lovely grain. The contrasting pecan apron and legs have wonderful detail. 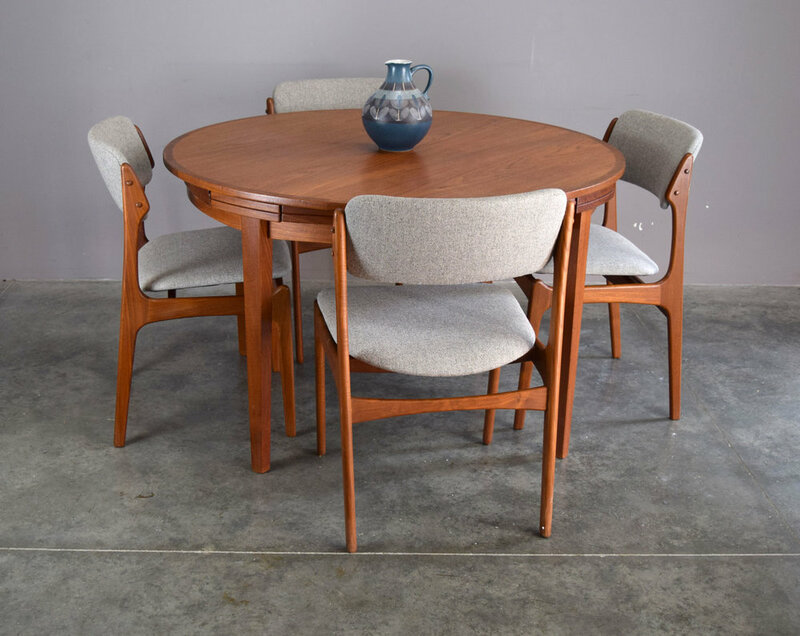 This table is wider than typical Danish tables, great for a larger space. Includes three 12” unskirted leaves for larger gatherings. 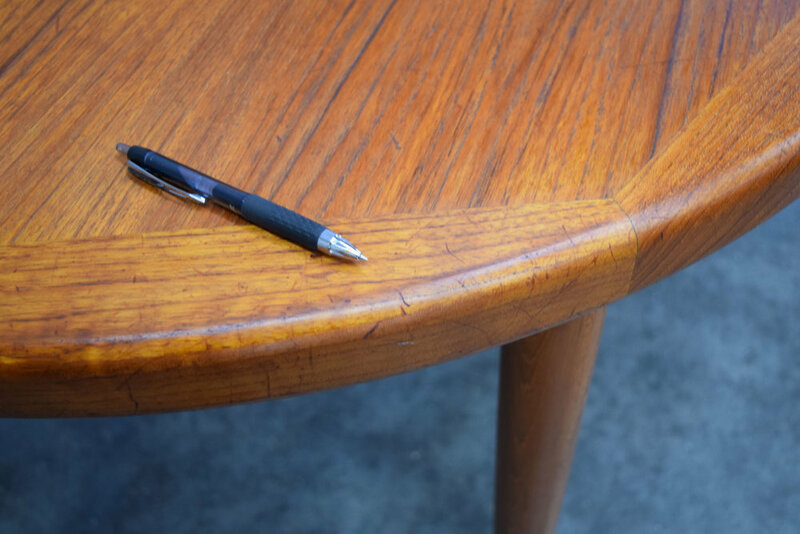 The tabletop is in excellent vintage condition, with a tiny chip on the center seam, a small dent on one edge, a small scratch and a 1/2” darker spot. See photos. Solid pecan legs have scuffs and abrasions from daily use. One leg has tooth marks from a Bad Dog ;) One leaf matches the top very well, the other two are slightly lighter from less sun exposure. 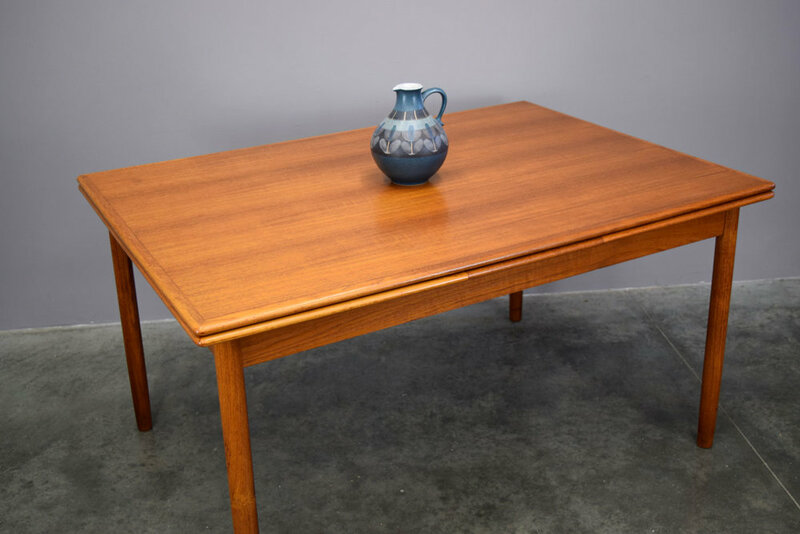 A beautiful vintage Danish teak refectory table. In typical ingenious Danish fashion, the leaves are self-storing, so you never have to worry about them getting lost or damaged. 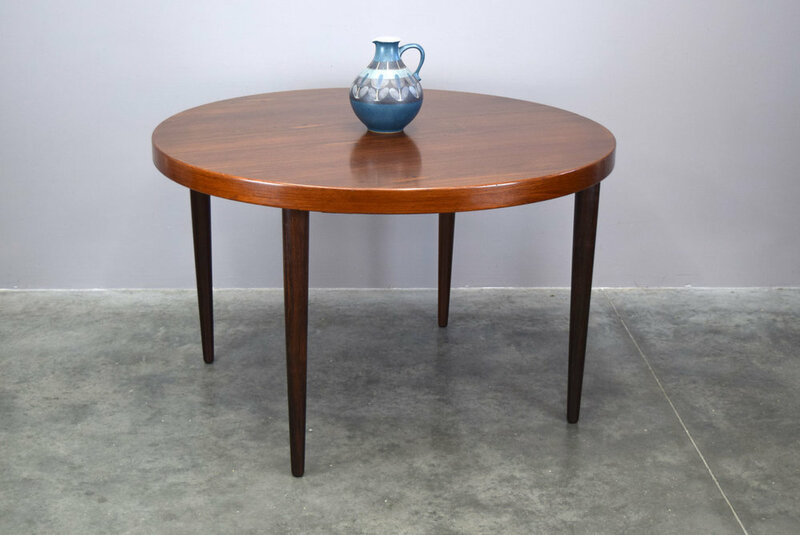 This table is c. 1960s and very nicely made, with softly rounded edges and handsome turned legs. 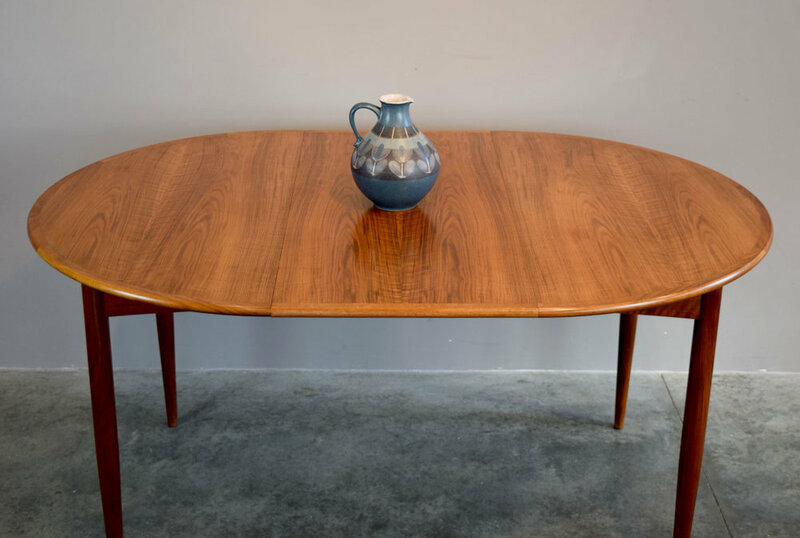 You can pull out one or both leaves to extend the table as needed: it is a very practical and dynamic mid-century design. This table is in very good vintage condition with wear commensurate with age and use including a few light scratches and bruises. 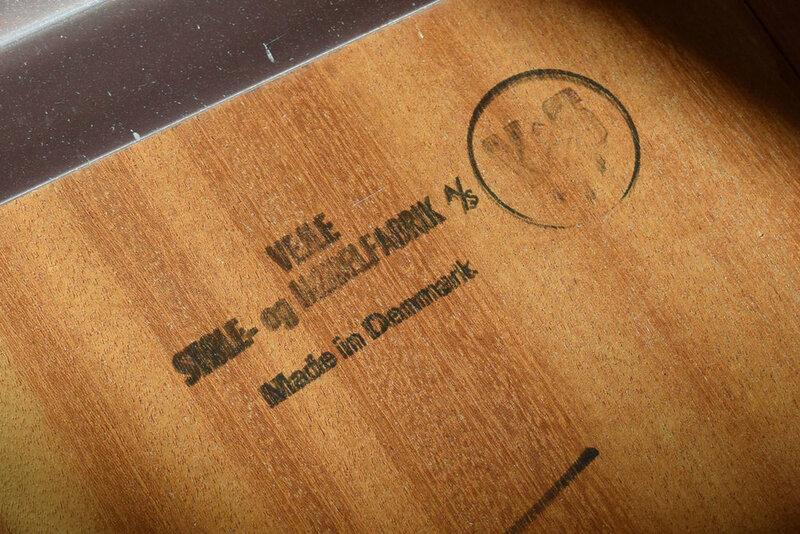 Stamped "Made in Denmark". 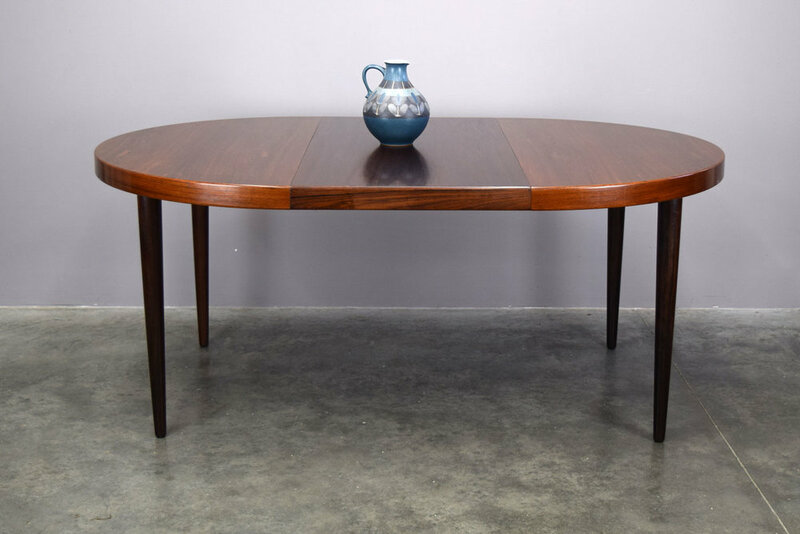 A wonderful minimalist dining table by renowned Danish designer Kai Kristiansen for the fine furnituremakers at Skovmand & Andersen circa 1950s. This example is executed in Brazilian rosewood (palisander). 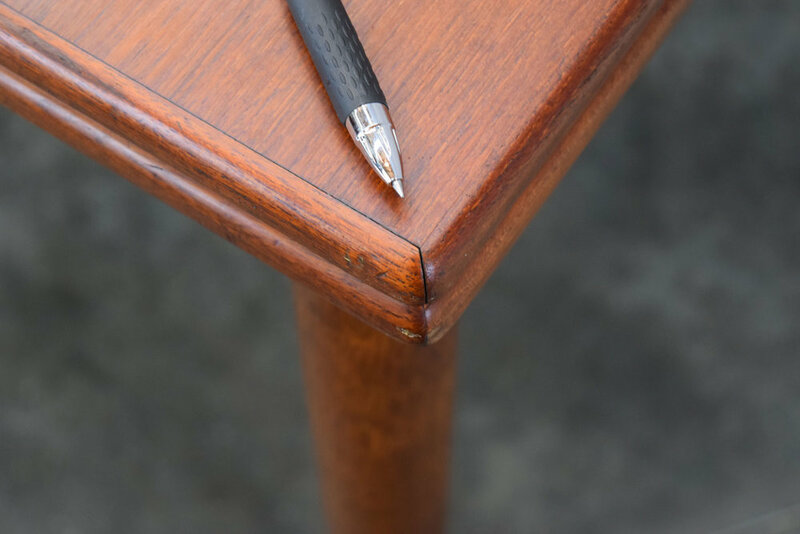 The tapered solid rosewood legs feature gorgeous grain and are extremely heavy! 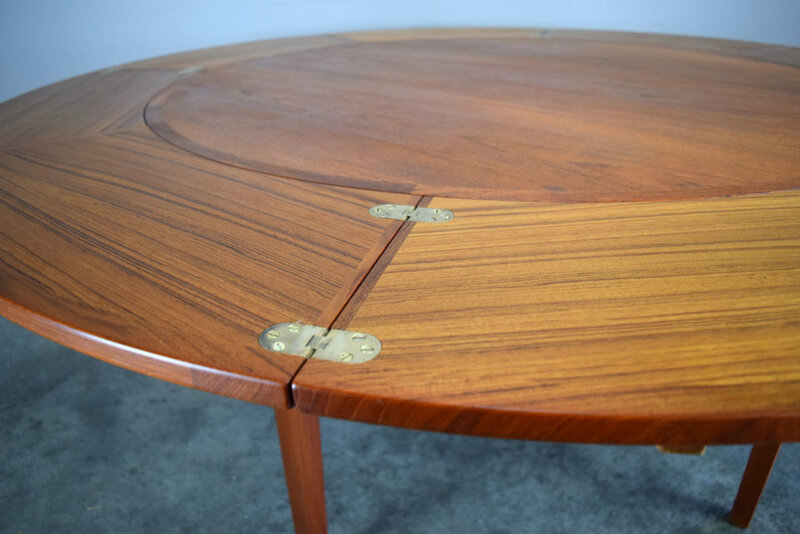 This table has been restored and the top refinished in hand-rubbed matte poly varnish, so you won’t have to worry about water rings! It’s in excellent vintage condition with only very minor, age-appropriate signs of wear. 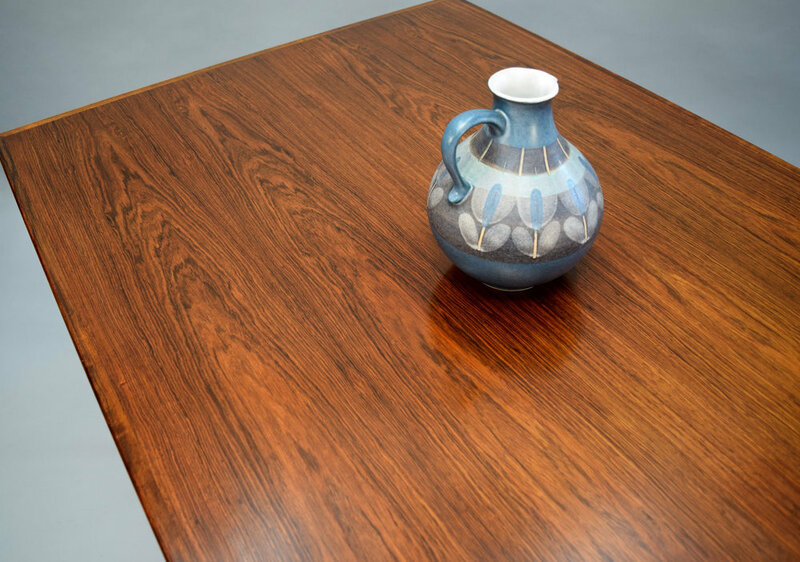 Includes one skirted rosewood leaf and an additional mahogany leaf intended for use under a tablecloth. 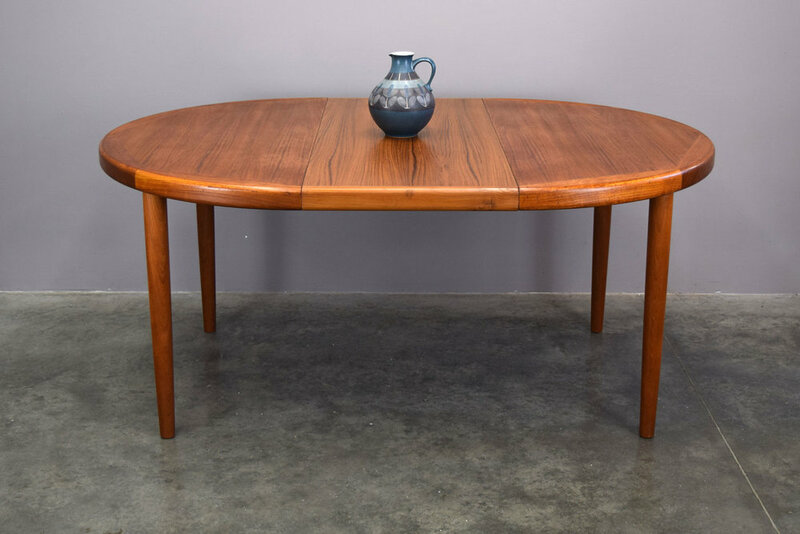 Lovely Danish teak dining table by Vejle Stole. We love the edge detailing! This table includes two leaves, expanding to seat a crowd. Includes custom-fit felt table pads for all configurations, to protect the table under a tablecloth. 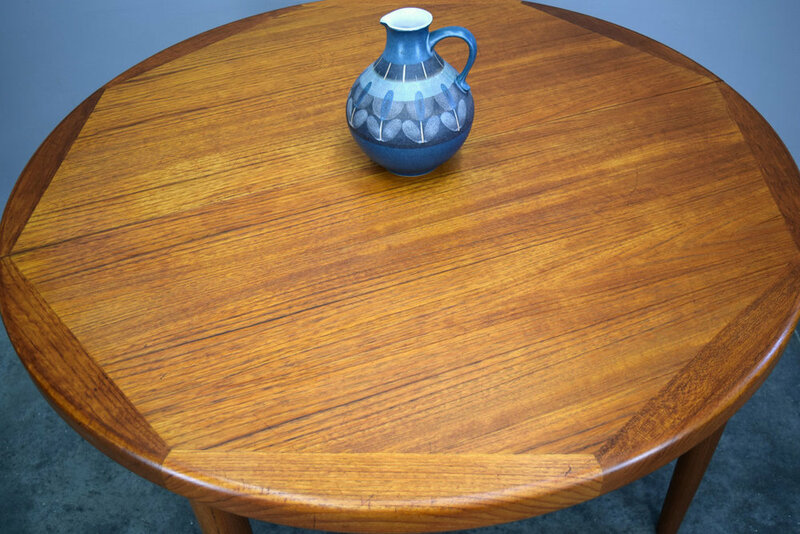 This table is in good used condition, with numerous scratches and bruises as shown. Price reflects flaws. A classic Børge Mogensen design for Søborg Møbelfabrik. 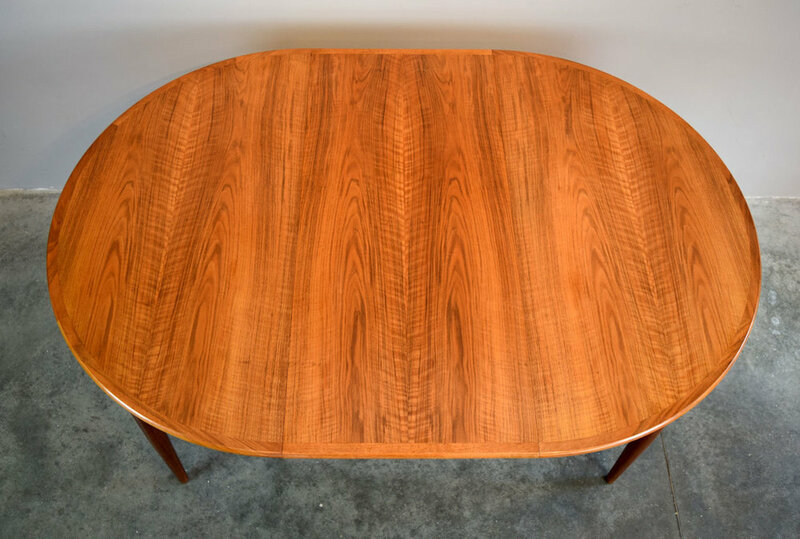 A wonderful Danish dining table that celebrates the beauty of natural wood. 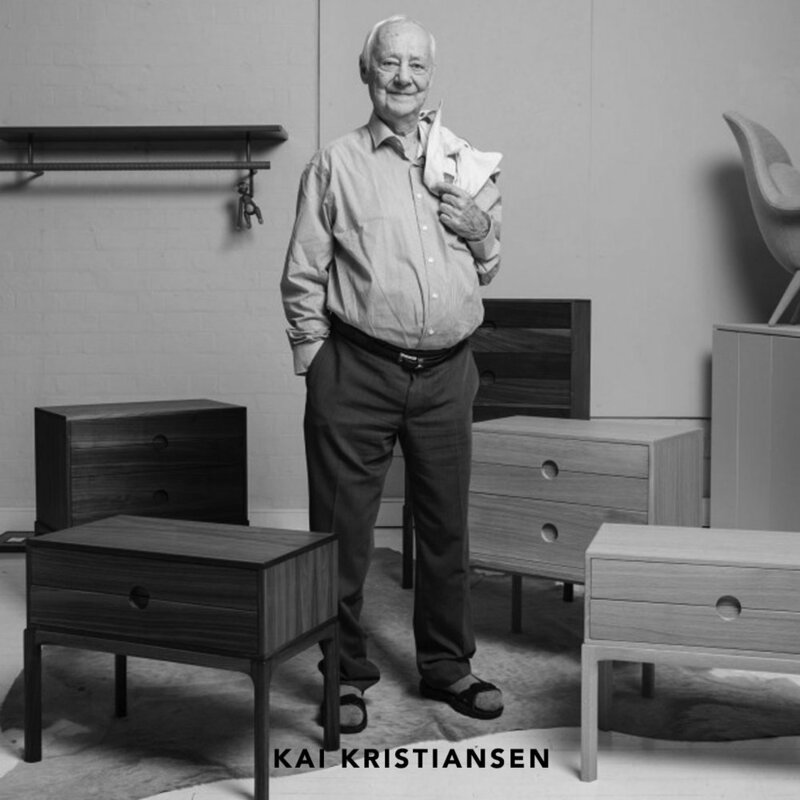 Warm teak-veneered top over a an apron and legs constructed of solid waxed European White Oak. 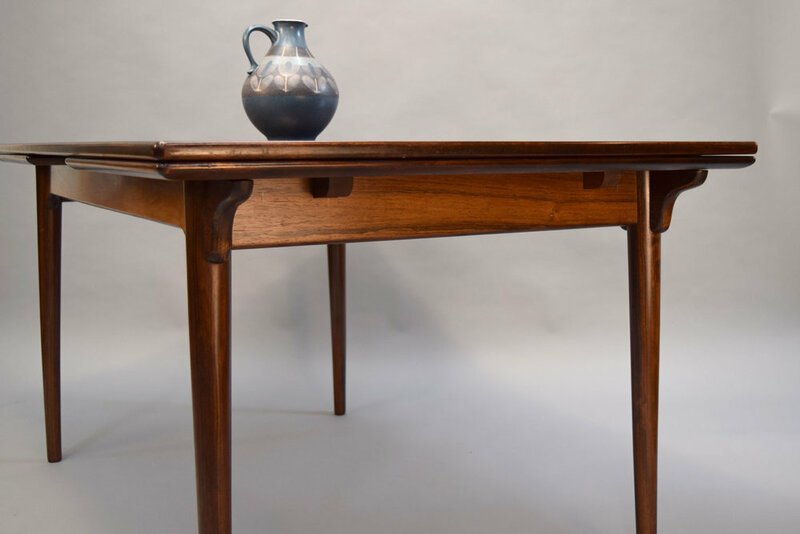 This table is beautifully made, with dovetailed corner braces and quality details. 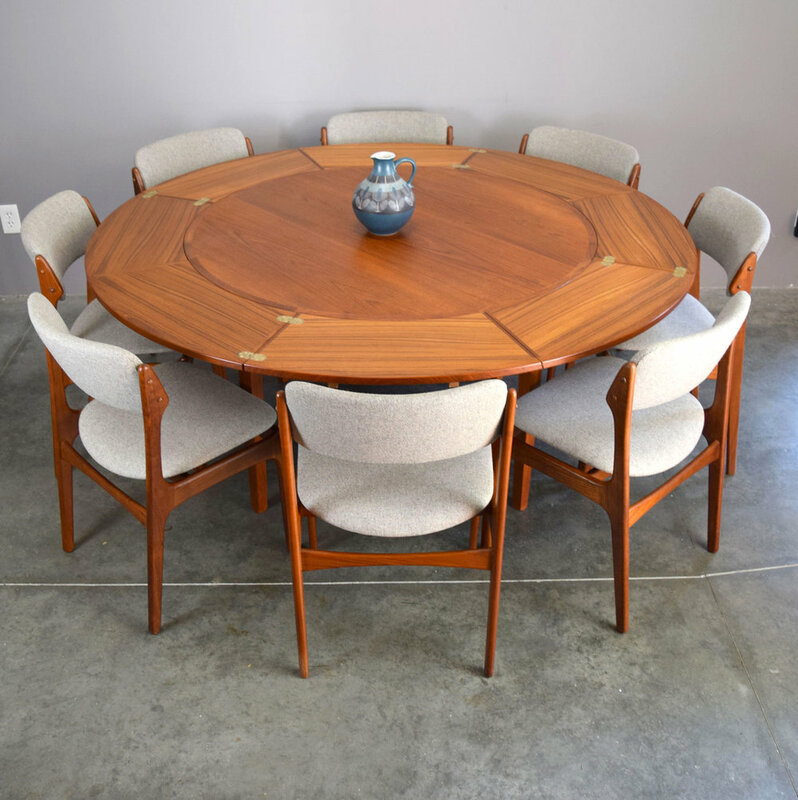 Søborg is one of our favorite table manufacturers! In good vintage condition. Structurally sound with signs of age including: minor age-appropriate scratches and dings, a 1” gouged area on the tabletop as shown, and one leaf has numerous scratches as shown. Price reflects the condition. Oh those clever Danes! 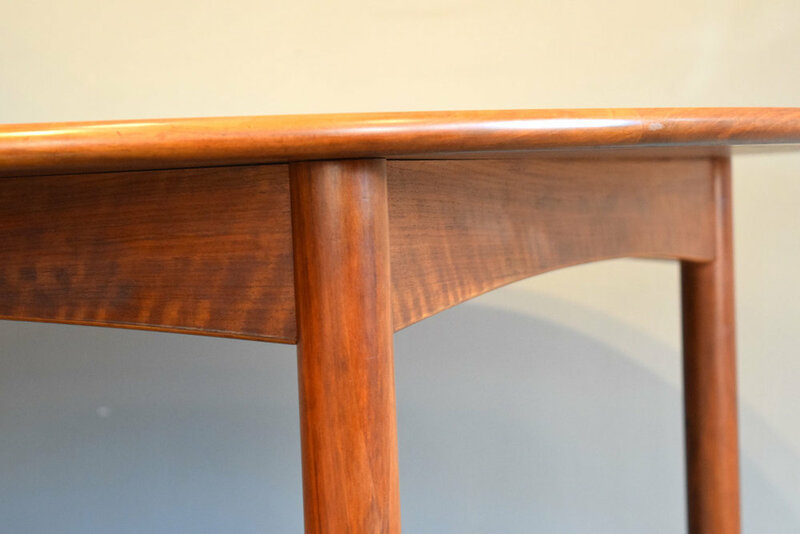 This beautiful teak dining table expands in a most unusual manner: four leaves slide out and then - flip flap - unfold to increase the diameter of the table significantly. When not in use, the folded leaves slide neatly back under the tabletop. Made in Denmark in the 1960s by Dyrlund Smith. So beautiful and cool! This piece is in very good vintage condition. 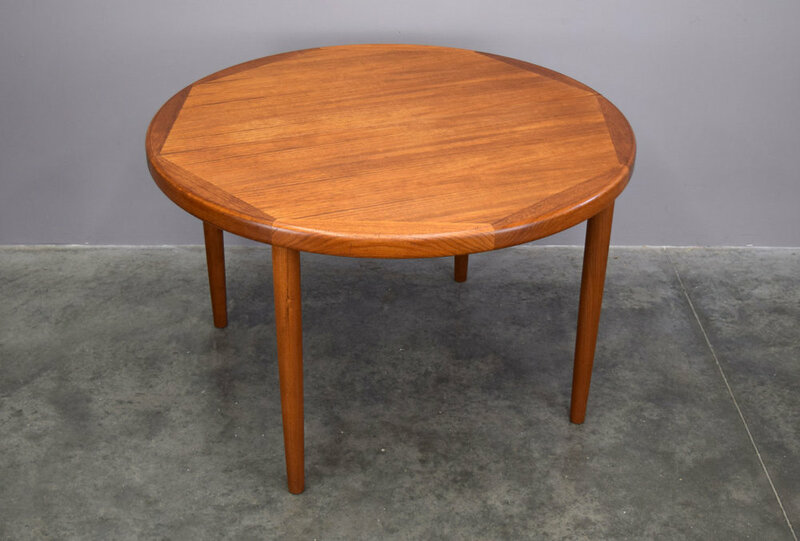 There is a slight color variation between the leaves and tabletop (due to sun exposure) that is common with vintage teak tables. Exposing the leaves to sunlight will even out the tone if desired. 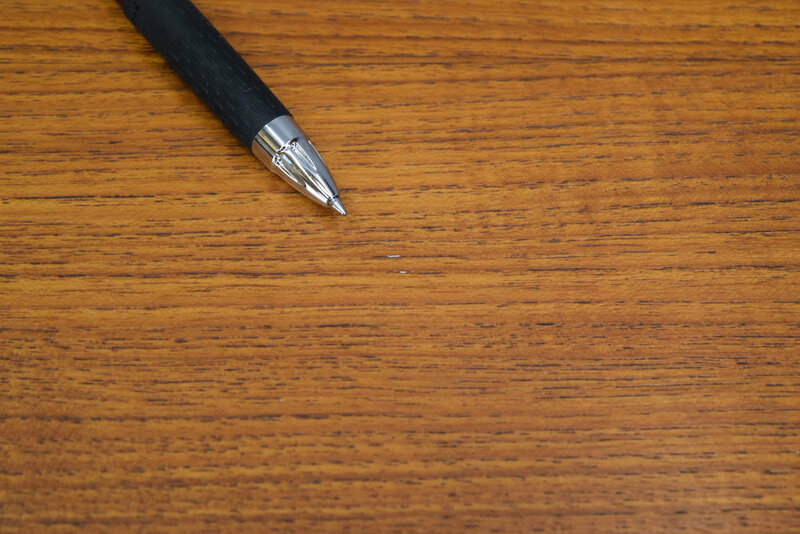 There are some small burn marks in the tabletop as shown, and light age-appropriate scratches. There is a small crack in the veneer of the curved apron and a couple of dings on the edge of the top. Price reflects these. This is a truly beautiful piece handmade by a master cabinetmaker. 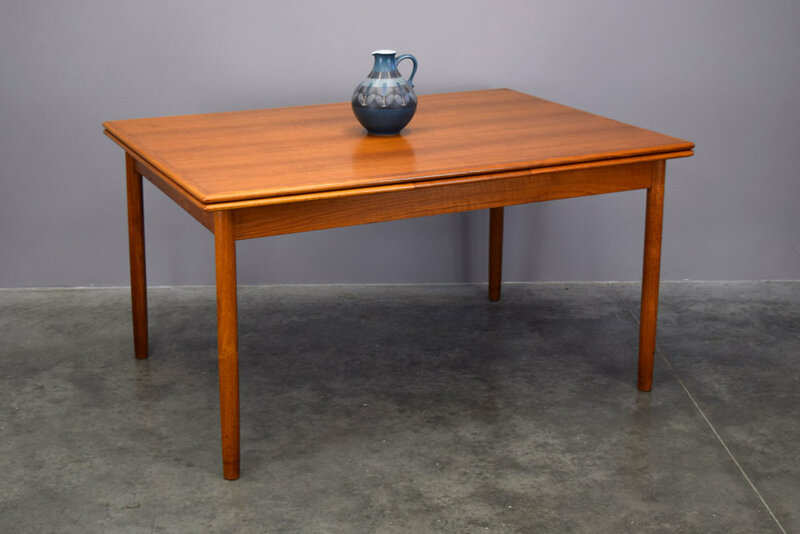 Unlike most Danish teak tables, which use veneers, this table is crafted of incredible 1.375" thick solid teak boards with a solid white oak slide mechanism. It is truly remarkable. The two leaves are stored in a custom crate to keep them from getting damaged. It also includes custom table pads sized for any configuration. This piece is in excellent vintage condition with only the most minor signs of age. 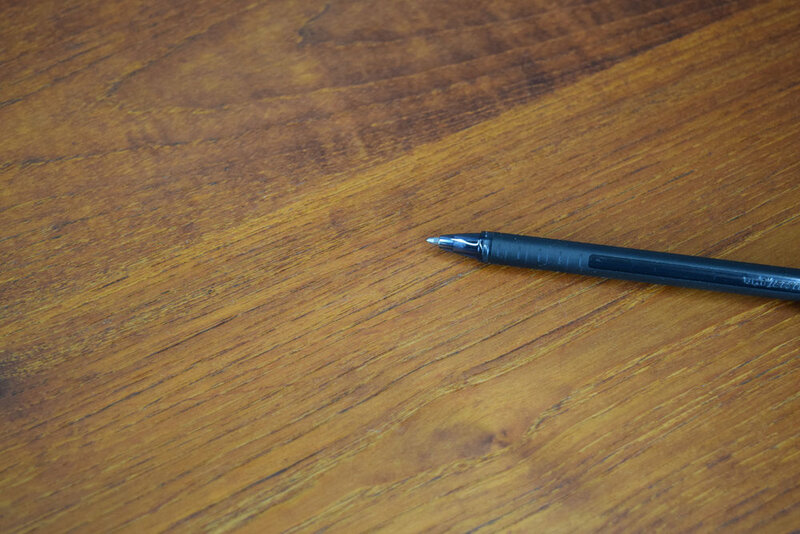 There is very minor slight discoloration, light stains and light scratches to the tabletop. 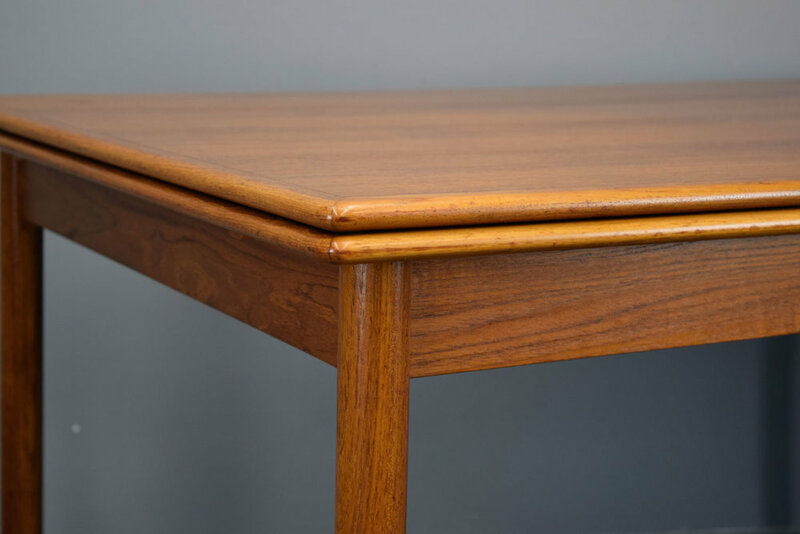 We did not sand this piece, since many people wish to retain the character and history of age, but since it is solid teak it would be very simple to sand and re-oil if perfection is desired. 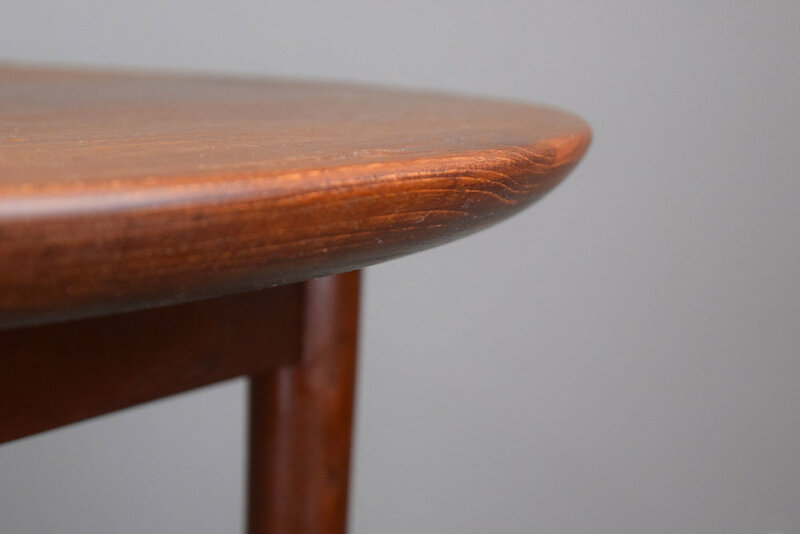 In good vintage condition with numerous surface scratches; typical dings and wear to the tabletop edge; an area of old water damage with slightly raised veneer. With both leaves extended it is a whopping 98.5" long. In very good vintage condition. On the apron there is a small area of repaired veneer and slight chipping (see photos.) 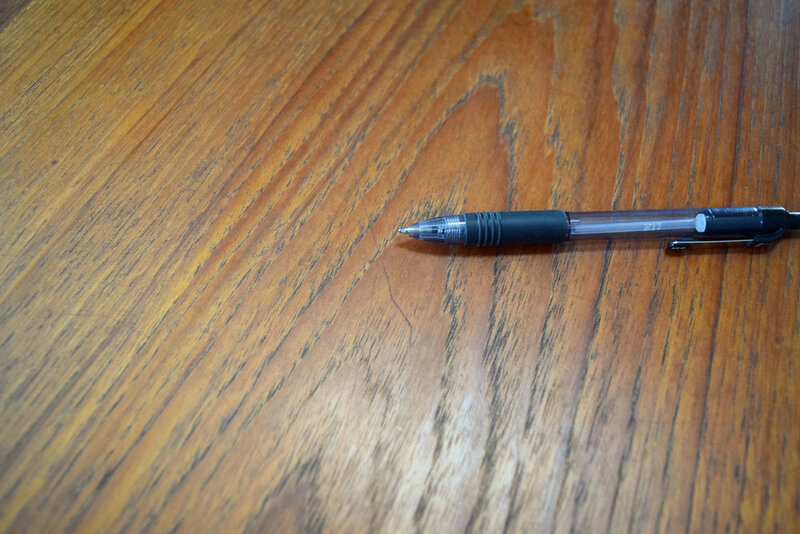 The tabletop has a pattern of sun fading with a darker center (exposure to sunlight should even this out) and one small circular spot near the end. See photos. 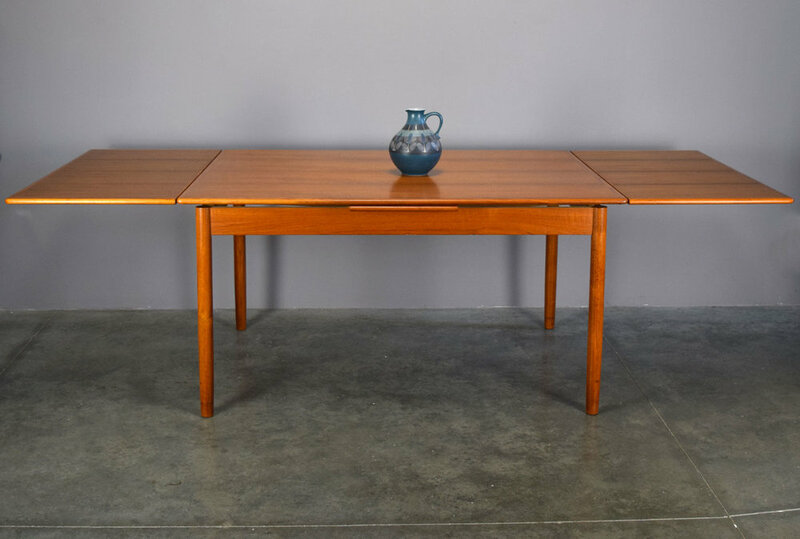 A beautiful vintage Danish teak refectory table. In typical ingenious Danish fashion, the leaves are self-storing, so you never have to worry about them getting lost or damaged. 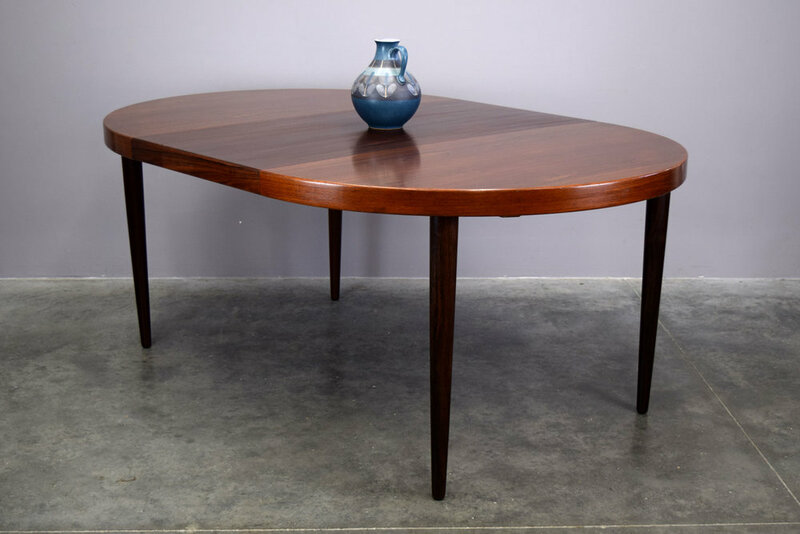 This table is very nicely made, with handsome turned legs and a gently curved/tapered shape to the top and leaves, rather than the standard rectangle. 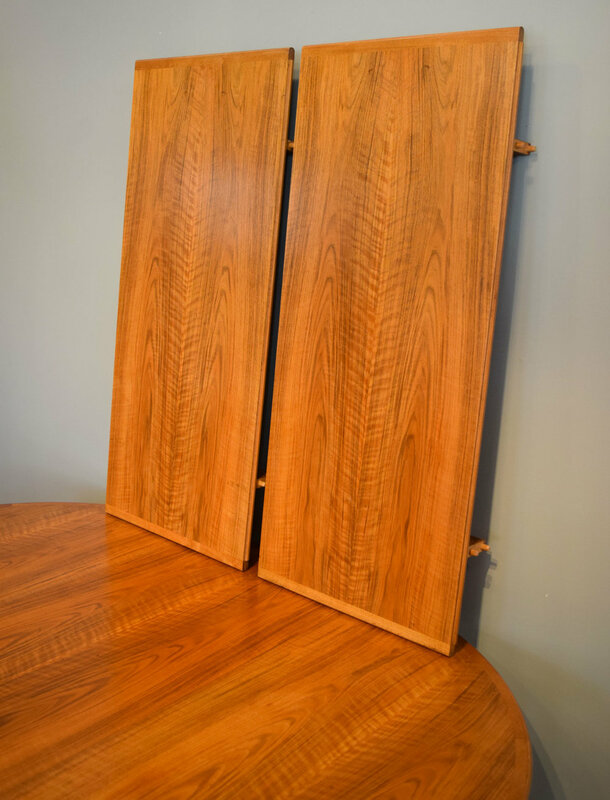 You can pull out one or both leaves to extend the table as needed: it is a very practical and dynamic mid-century design. With both leaves extended, measures 84.25"